Episode 12 of the TotalCon podcast is a panel of game designers taking questions from the moderator and audience. It’s a mix of folks I have met in real life, on the web and only know by repute. This was the first time I dipped into the TotalCon audio corpus and I’m glad I did. The panelists are all very down to earth and matter of fact about how they do what they do and why. They get into the behind the scenes shop-talk of freelancing and self-publishing, which is always my topic of interest in these matters. It only takes a couple clicks and some art to be a publisher these days, as one panelist notes, but it takes a lot more investment and work to be good. Thanks to Ben at Troll in the Corner for the link. 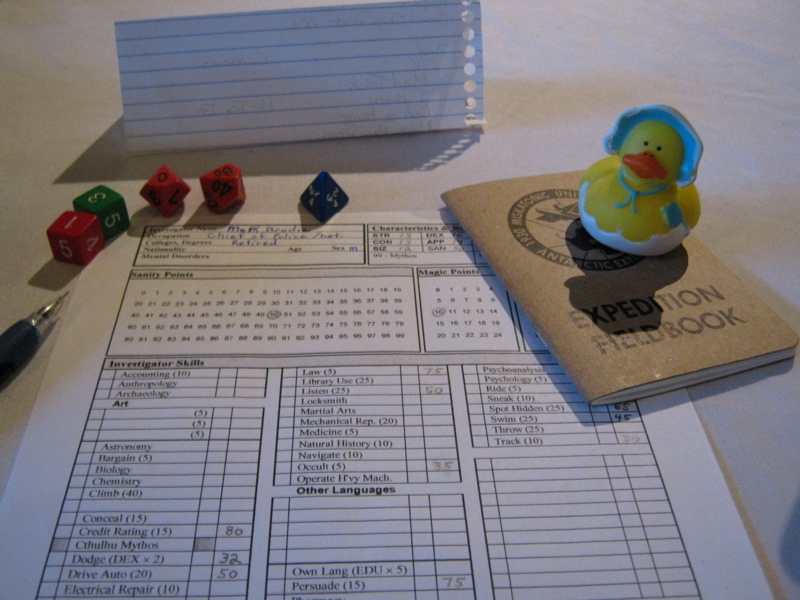 Dice, character sheet, notebook and duckie. What more does a hardy investigator need? Call of Cthulhu beckoned me on Saturday morning. It’s one of those games that inspires as many different interpretations as there have been of Lovecraft’s mythos in general. Pulp adventure with tommy guns and dynamite, a gore and splatter fest, psychological horror, or metaphors for a weird Rhode Islander’s views on society, race and class; I’ve seen them all proposed and explained. My own Call of Cthulhu experience is limited to a handful of GMs, however, so I wanted to take a plunge into unknown waters. As it turned out, this particular Cthulhu GM, Bob, not only had a practice of running daylong campaigns, but also had a dedicated following of players who sign up for all his games. I’ve let myself be put off by that in the past, but I’ve also played some exceptionally awesome games after pushing through that hesitance. After all, if the GM gets repeat players like that, they’re doing something right. Friday night of TotalCon was my first scheduled game: Abduction: CE4, a game using Brad Younie‘s The Unexplained to chronicle the activities of the Foundation for Paranormal Investigation. Brad’s worked on The Unexplained for as long as I’ve known him, and possibly longer. We met at OGC in 2006, where I played his Ghosts of the Lady Grace adventure. Then it was called Strange World — and, the Ogre’s Cave’s review tells me, apparently grew out of Brad’s prior game, Now Playing, which used “FPI: The Show” as a sample game framework. It particularly piqued my interest because at the time, and even since then, I hadn’t come across another role-playing game that took straight, real world paranormal phenomena and the study thereof — as in, the paranormal as we know it, rather than as game designers imagine it might be in a world of secret supernatural beings — as its primary subject matter. In addition to finally checking out the game, I had the secondary purpose of revisiting FUDGE, the super light rule system Brad uses in his games. I had an absolutely miserable experience with FUDGE in Ghosts of the Lady Grace with a phenomenal run of poor rolls and wanted to give the rules another play experience. Abduction: CE4 billed itself as investigating the abrupt disappearance of a college student during the observation of a low flying UFO, a true close encounter of the fourth kind. Half a view of the board game room at TotalCon. This past weekend was TotalCon, a four day convention in Mansfield, Massachusetts, somewhere between-ish Boston and Rhode Island. I rode down Friday with a couple of folks to help wave the flag for Carnage, New England’s other big game convention — though PAX East‘s imminent debut undoubtedly shifts the standings considerably. I’d only ever heard other people’s stories about TotalCon, so I was curious to experience it for myself. Checking in was surprisingly easy. I preregistered online, so all I had to do was pick up an envelope with my badge, event tickets and a swag bag — mostly promotional fliers, a rubber duckie and, most amusingly, a publicity photo of Mira Furlan as Delenn from Babylon 5, circa the show’s fifth season in 1998. Of the four games I signed up for, I got into three: two of Brad Younie‘s paranormal investigations and a Call of Cthulhu scenario called Curse of the Betrothed. I missed out on Frank Mentzer‘s Palace of the Vampire Queen, which was no surprise as I had registered relatively late and Menzter’s old school Dungeons & Dragons modules have become a smash hit on the New England convention circuit since OGC first had him out two years ago. So I had three events and two generic tickets in my pocket to kick off the weekend. Sometime later this morning, I’ll embark down good old Interstate 89, southbound for Total Confusion, the elder statesman of the New England gaming convention circuit. It’s my first trip to this particular show, though I have a rough idea of what to expect, from others’ tales. Fingers crossed for getting into one, if not two, of Brad Younie’s adventures in The Unexplained and plenty of board games on the side. I’ll have my trusty camera in hand, so you’ll get to see what the convention looked like, as best I can document it. If you attend TotalCon yourself, I’ll be — one of — the guy(s) in souvenir Carnage T-shirts. In the spirit of carpe jugulum, this afternoon I spontaneously decided to tag along with a crew going to TotalCon next month. I just got done going through the online registration process. Fingers crossed I haven’t missed out on everything I signed up for. Abduction: CE4, one of Brad Younie’s paranormal investigation adventures using his game The Unexplained. Curse of the Betrothed, a Call of Cthulhu adventure. Spirits Among the Ruins, another Unexplained adventure, centered around a lithic observatory in the New Hampshire woods. Palace of the Vampire Queen, a Basic Dungeons & Dragons game run by one of the venerable old men of the hobby, Frank Mentzer. TotalCon uses a ticketing system, so apparently whatever games I don’t get into are substituted for by a generic ticket. I’ve never been a convention that uses tickets before, so we’ll see how that goes. TotalCon, AKA Total Confusion, posted the bulk of their event listings yesterday. You’ll find links to schedule grids in PDF format on the Preregistration page. One of the things that strikes me as unique about TotalCon is they’re the only convention of which I’m aware with their own living campaign world. RPGA has Living Forgotten Realms and Paizo has Pathfinder Society. TotalCon has TC Realms, which, their website tells me, has been running for over ten years now. Given the general vagueness and variable dedication that roleplaying is subject to, given its nebulous existence between hobby and cottage industry, I’m impressed by anyone who can keep a shared campaign world going, and develop adventures for it, over such a period of time. Oh yeah, and they’ve got a crap-ton of other roleplaying adventures and board games on deck. It’s quite impressive. 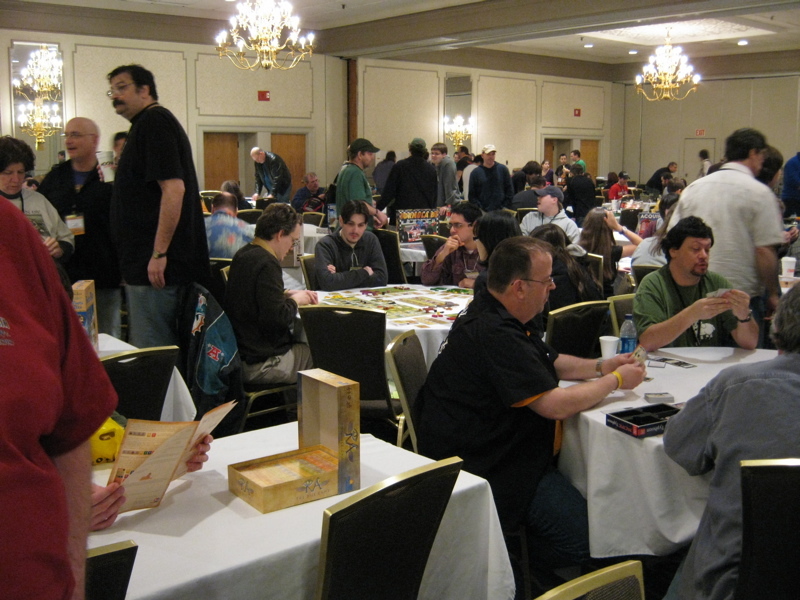 TotalCon takes place February 18th through the 21st in Mansfield, Massachusetts, which is eminently drivable from a large portion of New England.